Affiliations: White Feather, Lightfeet (horse), Jim (his foreman), Sherrif Grisley. Powers/Abilities: His ability to see very well at great distances is so extraordinary that it has caused Native Americans to give Bob his nom de guerre. It comes in very handy for spotting traps and ambush parties. His ability to see in very low light conditions (non-absolute darkness) falls clearly in the superhuman range. That does not mean he can see as well at night as in broad daylight, but as he sees better than normal men under both conditions, other people get that impression. Bob is very talented and well trained in the use of fire arms, but he never shoots to kill. He is trained in stealthy movement and tracking by the best (i.e. White Feather). He is a great rider, the only person White Feather´s horse could not get off. Bobs horse and companion, Lightfeet, is probably the fastest horse in the West. He is very well trained and saved his master on several occasions by his speed, intelligence and agility. Bob is also a great rancher, which keeps him financially secure, and if it has to be a good cowboy too. History: Bob was the only son and eldest child of Roman Catholic immigrants from England. He had a peaceful youth, but his life changed dramatically when he was only sixteen years old. His father had reported a major bandit, Fred Moulder, to the authorities. Moulders took revenge by besieging the S-Ranch and killing Bobs father. This made Bob decide that he would dedicate his life to helping others and to trying to prevent others having to experience the same loss as he had. From that moment on, he and White Feather hunted thieves and villains, faced danger and fought evil. In the first years of his crime fighting career he operated from a hidden cabin, co-operating with the law, but not part of it. He used his abilities and the friendship with the natives (most especially White Feather, who had given him his nom de guerre) to good effect, garnering a powerful reputation as a superhuman crime fighting force around Mining Valley, a crime-ridden gold rush town. After defeating Moulders, Bob restarted the S-ranch, which soon became a flourishing business. Most of the time, he lived there in peace with his family. Three years later, when most of the gold had been removed from Mining-Valley, most of the miners were gone, and peace ruled, the theft of the cattle of the S-ranch reunited Bob and White Feather, and began a period of chaos, crime, theft and murder. White Feather converted to Bobs brand of Christianity, which Bob had been promoting among the natives and Bob started a sort of citizens' watch. Soon after Bob became a deputy. Bob often worked together with the federal army and the police force, which he was part of in his function as a deputy in the district of Mining Valley. His adventures, however, took place not only in Arizona; Bob travelled to other states like Texas and California, and was also asked to solve mysteries abroad, in Mexico and Canada. Bob became widely known throughout the States, eventually being thanked personally by the President of the United States for services rendered in Washington DC. Comments: Arendsoog was created by the head of an elementary school J. Nowee, who also volunteered in a library, to give children, mainly boys, the cowboy stories they wanted to read. Karl May was still too difficult for them and hardly anything else was available and suitable. Arendsoog combined the traditional western hero, with Roman-Catholic values fit for children. The series continued with the same publisher until 1993, the year in which P.Nowee, a son of J.Nowee, who had inherited the position of writer of the series during the writing of book #20. New books were added until the series was ended by the death of Paul Nowee. The main series had a publisher to which school books were the core bussiness, the publication of the series was stopped when the publisher decided to concentrate more on that. However in November 2004 four of the books appear on the market as paperbacks with a different publisher. Especially in the early years its frequently shown that Bob is a devout Catholic, but later on his good principles are explained from his pure character, rather than his religion. Bob Stanhope is not the strongest man on the world, but he is shown to be kind, modest, intelligent, quick and filled with justice and a great sense of humour. Bob is not a person with no flaws, he has his bad habits, but that makes him a real personage and not just a flat character. In more than 65 adventures (mostly long, sometimes shorter) he shows himself to be a true hero. Not unimportant is that he has many friends, who often help him or ask him for help for themselves or others. Nevertheless, Bob is not created as a invulnerable person. Death is sometimes nearby for him and his friends, and sometimes things seem rather hopeless. 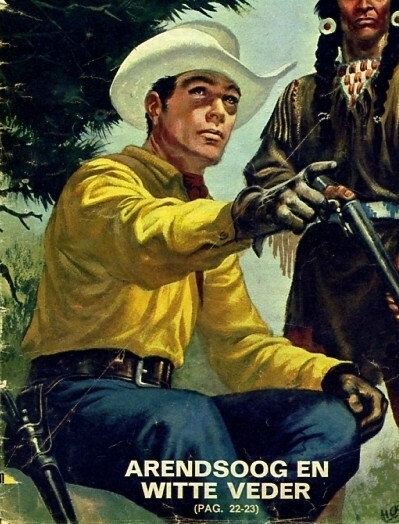 Still, Bob always manages to get out of trouble and stay the hero of the West! Arendsoog had a comic strip, drawn by The Tjong Khing appearing in Pep in the years 1967-1968. Before that there had been illustrated stories about him in that magazine. Those stories were illustrated by H.G.Kresse, who was THE expert in Dutch comicdom on Native Americans. That all contributed to the creating of the iconic value of Arendsoog, equal to that of that Belgian cowboy Lucky Luke; both have all the cowboy hero abilities, and some superhuman ones, a horse without equal in all of America, but where Lucky Luke is a parody of the Western, Arendsoog is a series of moral lessons in the form of Western stories. Just to clarify, Arendsoog is defined as a mutant by this site because he has an apparently superhuman ability that he was seemingly born with. He isn't a mutant in the more traditional X-Men "parents exposed to radiation" sense.